Think I’ll make these this weekend, how about you? We got a Waffle maker – the Belgian kind — from Santa Claus for Christmas, along with a bag of waffle mix. Ours is a Andrew James 4 Slice Red Belgian Waffle Maker. It works well, heats up quickly and evenly. We haven’t had any waffles stick to the non-stick plates, but who knows in a few years…. 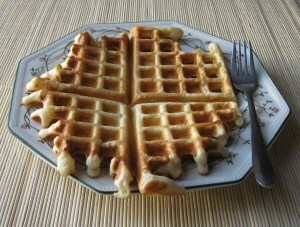 We used the waffle mix up the 1st 2 times we used it; they were OK, but very crispy and airy and went cold very quickly. I used this recipe, which came with the machine, and it was much better — more like a ‘real’ belgian waffle (which is actually a yeast batter). They were softer, and more dense, with just a little crunch on the outside.